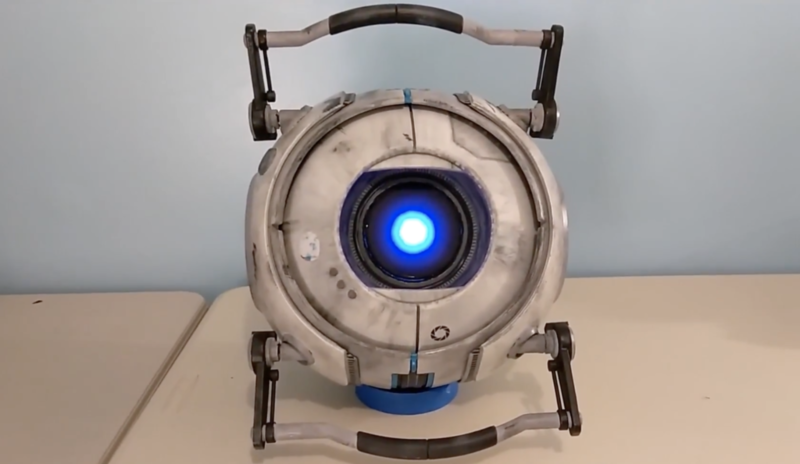 If you’re a fan of Portal games, you’d probably like nothing more than to have your own Wheatley Personality Core to accompany you on real-life adventures. While that would be a passing thought for most, Luke Albertson has created his own amazing replica of the Portal 2 character. The device not only can say over 40 phrases from the game via an Adafruit soundboard, but contains a glowing blue eyeball that can pan, tilt, twist, and blink to help express what it’s thinking. It even has handles that move up and down, adding a kind of “flailing arms” effect to convey its emotions. Albertson’s animatronic project is controlled by an Arduino Uno, along with a Bluetooth shield and PS3 controller for user interface. It’s shown off quite nicely in the video below, and more info and clips are available here. Hi ARDUINO TEAM and arduino.cc! I was checking my website traffic and was pleasantly surprised to find that you had made this article about my Wheatley robot. Thank you for spreading the project around! I would liked to have been contacted before the article was published, so keep that in mind for future articles. You did a good job though, so I don’t have any complaints.